Don’t make excuses, make time. It’s time for our very first Guest Blog on the Hasseman Marketing blog! This one comes from Bill Petrie from brandivate. Bill is a rock star in the promotional industry with wisdom that translates to any industry. Take it a way Bill! Excuses. Excuses are insidious little beasts. They provide convenient, if not somewhat accurate, reasons we tell ourselves – or others – why we can’t accomplish certain tasks necessary to build our business. From the ubiquitous “too busy” to “we’ve always done it this way,” excuses manifest themselves in many different forms. Despite the various excuses readily available to avoid uncomfortable and/or unpleasant business tasks, the outcome is always the same: stagnation. The real problem with excuses is that they become a habit – a bad one. For example, often people will say they are “too busy” to do something without giving it any thought. The habit of making excuses to avoid difficult or challenging tasks creates a false sense of comfort that prevents growth. Bad habits, however, can be broken and the habit of excuses is no different. The key is to respectfully challenge the person using the excuse – and that person may be the one in the mirror. Next time you hear an excuse, simply ask, “What do you mean by that?” This will cause the person using the excuse to not only think about what they are saying, but why they are saying it. For example, when someone says they are “too busy,” it usually means that the task really isn’t important to them. 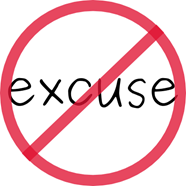 By giving pause to understand WHY someone is habitually using an excuse, it will begin to break the habit and stop stagnation. Don’t make excuses, make time. Bill Petrie is an executive leadership guru in the Promotional Products industry. He has over 15 years of experience helping companies grow, and he brings that experience and passion to brandivate. Bill has a fantastic blog on the brandivate site (that you should read). Oh, and in one interesting turn of events, we both have Guest Blogs on each other’s sites today. You can read mine (on his) here!